Dentures are artificial teeth mounted in an artificial gum that is temporarily affixed to the natural gum of someone who has had their teeth removed. You may have seen dentures soaking in a cup overnight when visiting family or friends before. WHAT ARE THE BENEFITS OF MODERN DENTURES? Old dentures were limited in quality and craftsmanship and often led to embarrassing or inconvenient moments. Todays dentures are made of extremely durable materials that enable the wearer to do most things that someone can do with natural teeth. Not only are modern denture materials stronger and more durable, they can be amazingly natural looking. The denture materials can even replicate the transparent sheen you seen in the tooth enamel of natural teeth. Implant-supported dentures are very similar to normal dentures in nearly every feature except one. Implant-supported dentures are affixed to dental implants that have been placed instead of your natural tooth roots. 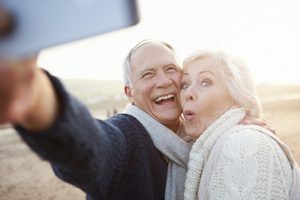 Though there is a little more involved in the implant-supported denture procedure, many opt for this treatment to claim its benefits. San Diego dentist, Dr. Marcos Ortega, has had fantastic results with implant-supported dentures—not to mention thrilled patients. The common concerns about dentures (dentures falling out, having to clean them every night, limitations on what one can eat, etc) are solved with implant-supported dentures. Because implant-supported dentures are permanently attached to the dental implants placed in your jaw, you don’t have to worry about embarrassment from dentures falling out, having to remove them to clean every night and you can eat what you want. They are also BEAUTIFUL. You can flash that beautiful smile around all you want because implant-supported dentures won’t get tired. There is one more significant advantage to implant-supported dentures worth mentioning here. Dental implants can slow bone loss that occurs when natural tooth roots are removed from the gum. This bone loss contributes to the “saggy” face associated with dentures. The bottom line is implant-supported dentures can help preserve youth longer for the wearer. Call San Diego dentist Dr. Marcos Ortega, today to schedule a consultation and see if dentures are right for you. You can also contact us using the form below. Dr. Ortega has helped patients throughout San Diego, Mission Hills, and Hillcrest restore their tooth appearance and functionality with his denture expertise!